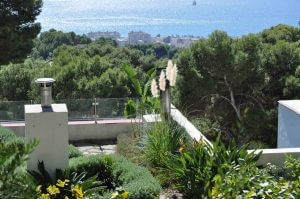 One of our masterpieces is this Villa Malaga on the hillside, in the district of El Palo, Málaga. The very discreet residential area is particularly green and mostly very steep, with these customers we had to overcome 26 meters of height – in a 1000 m2 plot. It was equally important for the builders that the villa on the slope should have three residential units, a large penthouse, as well as 2 guest apartments on the first floor. 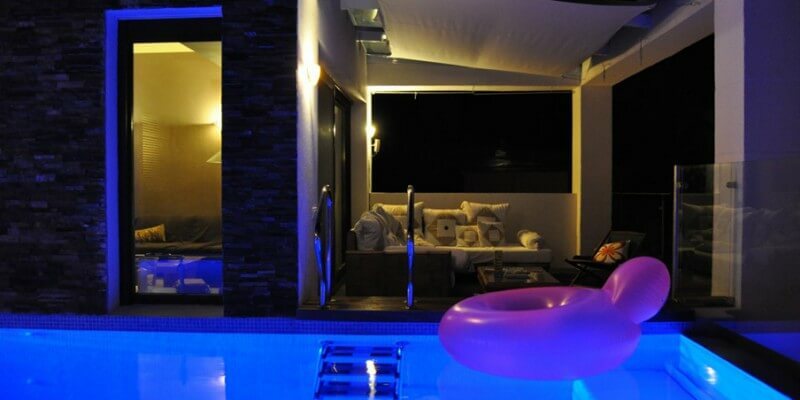 The almost unsolvable task we have solved, and even expanded: In the Penthouse, we offer besides a comfortable 200 m2 apartment also a 9 m infinity pool, as well as 70 m2 terraces, of which 20m2 are covered. The roof of the penthouse is accessible via a patio with orange tree and built as a roof garden. The builders are now cultivating lettuce and tomatoes on their roof and are happy about the bioclimatic, natural cooling in the house: the automatic irrigated earth of the roof garden evades its environment with the evaporation heat (a physical process), the earth and the underlying roof is thus permanently cooled. An effect that is useful in the summer, because the cool ceiling on hot days conditions our penthouse. Without the use of energy. The villa on the hillside in Malaga also has some interesting details: by elevator we access the residential house over three floors, the penthouse floor is accessible only by key switch. In the first floor we have arranged 2 guest apartments, each with private terraces and gardens, which are only accessible via the respective apartments. Technically, the house is very well designed: the hillside means that rain and drainage water can only be collected at the bottom. For this purpose, we have built a 20.000 l rainwater tank that collects the water from the garden, roof garden, drainage, terraces etc. And reuses it for irrigating the garden. This saves resources and costs nothing. In the roof garden, everything is prepared to use future alternative energies: solar panels already heat the tap water, but the house can also be completed with a photovoltaic system, for the extraction of electricity.